The main event is over but that doesn’t mean the excessive consumption is. It will take my brain a little bit longer before it figures out that it ought to stop eating so much. Right now it’s the lull before New Year and while most people are off work, I’ll been in for a few days and so haven’t had the chance to take advantage of the mild weather to do some gardening. Not that there is a great deal to do. There’s just some maintenance and tidying and I ought to check up on how the greenhouse is. 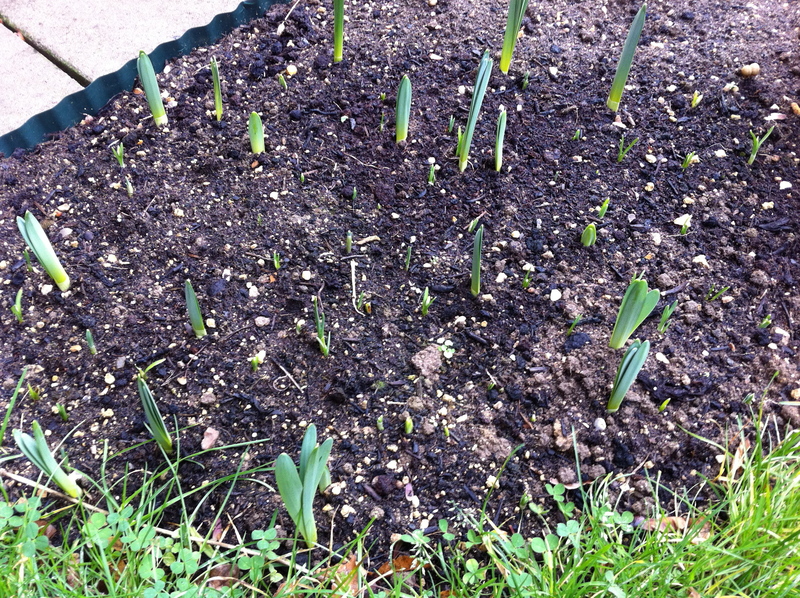 The spring bulbs are taking advantage of the mild weather and have started growing. The snowdrops and daffodils are already off. This patch of ground is part of a new border I dug this year (it has one end of the arch in). As I was digging up the lawn, the naturalised daffodils that I also dug up with it went here, as did some of the 1000 snowdrops when I ran out of space in the rest of the garden. The very last snowdrop I planted is somewhere in there. Next year, I will probably end up filling this space with snapdragon sown from seed from plants this year. Wildly, vividly coloured, gaudy snapdragon – they’ll look fantastic.